I didn't look all that closely at the plot description of Raw Meat, so I didn't realize that I'd end up watching two subway horror movies in a row! 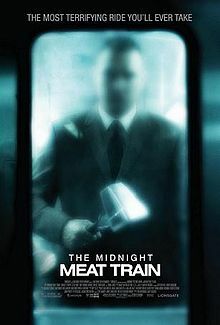 Still, Midnight Meat Train was a really excellent slasher movie, and I'm glad that I included it. From what I've read, studio politics doomed it to have essentially a DVD-only release, but this could have easily held its own in the theaters. This movie is adapted from a Clive Barker story, so it's got a solid foundation. I may have underestimated Bradley Cooper. I haven't seen his whole body of work, but what I have seen (mostly Wedding Crashers and The Hangover) made me think that he was pretty much capable of playing one kind of character - the intense, kind of fratty guy who you would kind of like on the surface, but not really. It turns out that his natural intensity also translates really well to horror. Cooper plays a photographer who is trying to get a gallery showing, but has been told that he needs to take more pictures that capture the real side of the city. He heads into the subways with his camera and interrupts a group of thugs who are harassing a beautiful woman, frightening them away by threatening to turn their pictures over to the police. He continues to snap pictures of her as she boards the train, only later finding out that she was a famous model, and that he was the last person to see her before she vanished. As he examines the photos he took that night, he finds the person he believes to be her killer, and also finds that she is only the latest in a string of similar disappearances going back over a hundred years. He sets out to find more about the mysterious man in his photo, only to be drawn deeply into a horror even greater than he imagined. First the good things. (SOME SPOILERS AHEAD, although I'll try to keep them small) Like I said above, Bradley Cooper's future may not lie in horror, but he is certainly at home in a scary movie. His driven demeanor makes him both a compelling hero and, when the ending twist comes, a believable baddie. If you watch horror movies for the gore, this movie brings it. Seriously, the kills in this movie are downright balletic, with cascades of blood and eyeballs popping clear out of sockets. You know right away who the killer is, and you know that each time he approaches somebody, they're going to get it, but MMT just keeps escalating the craziness so much that you still stay surprised. I also really enjoyed seeing how far the conspiracy to keep these events covered up went, once it starts to unfold. Now, the bad, which I fully acknowledge is probably nitpicky on my part. I have mentioned this before, but I hate when the twist in a movie is "because of aliens, that's why." That's not the exact twist in this one, but it was close enough that I still groaned a little when I found out the reason for the killings. Fan of the slasher genre? You will like this one. I give it four meat hammers out of five. The title of this movie could also double as a pickup line: as in: "Hey, baby, want to ride my midnight meat train?" Are you kidding? That's awesome! I was going to make a joke on the last thread about having some fun, since you're fun-sized, but then I decided to leave it alone.